By the time kids reach the 8 to 10 age- range, they are truly becoming capable of putting in some substantial miles on the trail with Mom and Dad. As you know, mountain biking is rough and taxing on the components of bikes and kids need a quality build too. Below is an overview of some of the best 24” cross country mountain bikes available. We’ve grouped them into our “top 5” favorites and then a bunch of other bikes that are worthy of your consideration as well. As you peruse the weight, price, and build info, you’ll probably notice a trend. The bigger brands are good at building bikes at an affordable price point, but don’t necessarily consider the body weight ratio of a child and their bike. The small boutique brands, on the other hand, are offering lighter frames with components designed to specifically fit little ones but come with a steeper price tag. If you’re a bike geek, make sure to scroll all the way to the bottom to see our big comparison chart with specs. With multiple build kits and color options, the Tailcraft Pineridge 24 is a versatile xc ripper for your young ones. We would probably select the cheapest full build available, but like any other bike, the higher end components are available…for a price. At a mere 21.5 pounds, the Trailcraft Pineridge is one of the lightest xc kids bikes on the market. Trailcraft also offers a titanium version if your little person is SPOILED! Stans Crest MK3 wheels help round out a build with a quality component spec that will leave you drooling and wishing you had one too. The Prevelo Zulu 4 is an eye-popping hardtail designed for small riders. A slack geometry design, combined with an 80 mm Suntour fork, provides enough plushness up front to allow the mini shredder in your life to not only keep up but remain comfortable and really open up on the trail. 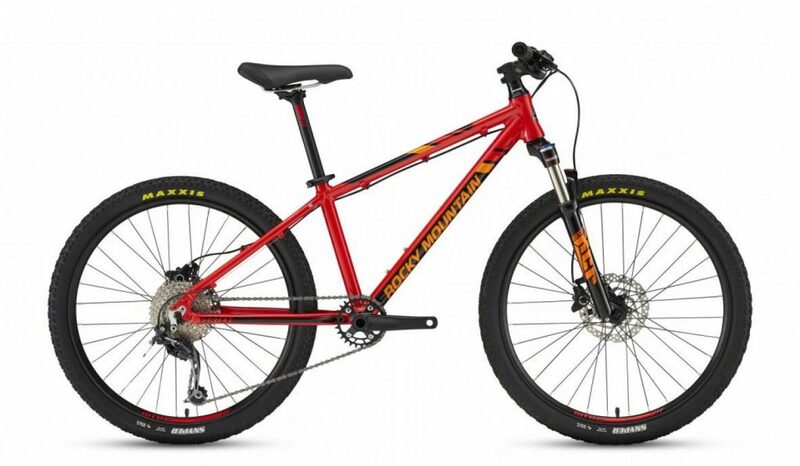 This bike is definitely a cross-country ripper with a Shimano drivetrain, Promax hydraulic disc brakes and in-house components designed to fit kids. The Prevelo Zulu is one of the cheaper bikes on this list but provides serious quality in the build. For more information, read our overview of the Prevelo Zulu line. Spawn has become nearly synonymous with children’s mountain bikes and for good reason. The creators of Spawn sought to create quality kids mountain bikes so their kiddos could ride with them and enjoy all the benefits of a nice bike. 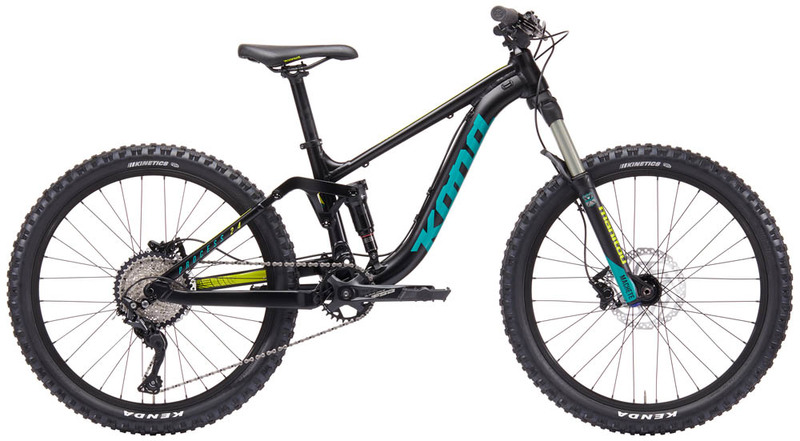 The Yama Jama is their hard-tail trail ripper. With an X-Fusion fork, SRAM drivetrain, Tektro disc brakes, Brood (child-specific brand) components, and Brood 2.3 tires your little ones can cruise with the freshman NICA class and have enough beef in the bike to conquer chunky trails. For more information, read our detailed Spawn Yama Jama review. These British bikes are absolutely beautiful! A solid component build includes SRAM Level hydraulic disc brakes, Maxxis Snyper tires, and Spinner air fork. The Trail 24 was designed to help the preteen in your life to get after it on the trail. 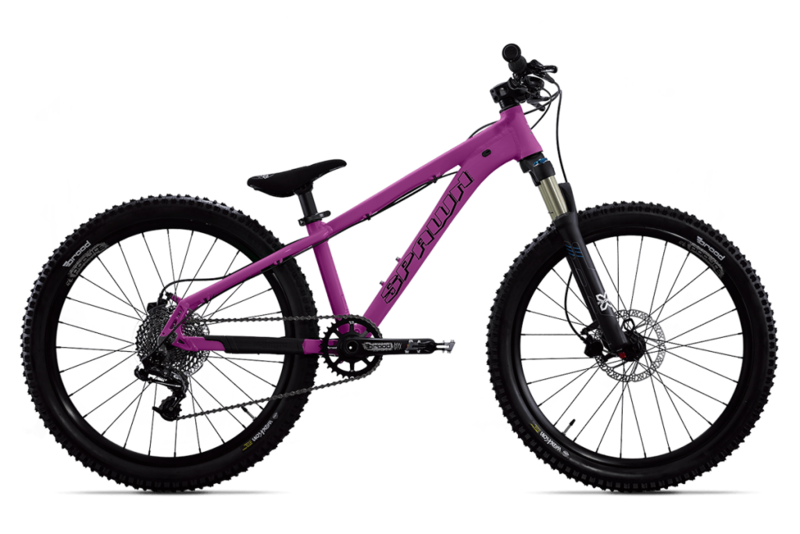 Frog Bikes makes amazing bikes for kids, and the MTB 62 is no exception. The bike has 65mm of travel, Tektro hydraulic disc brakes, Shimano drivetrain, and Kenda tires. 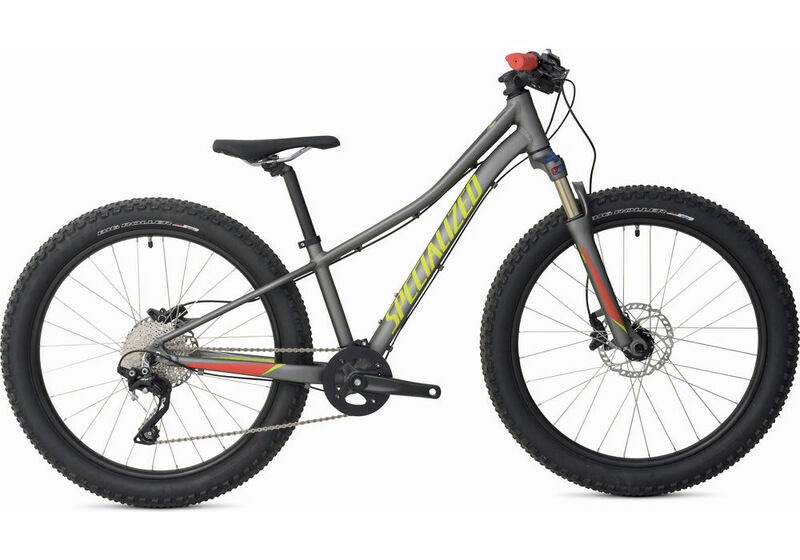 At 24.9 pounds it’s not THE lightest mountain bike around, but for this price point it is tough to beat. For more info, read our article on Frog’s Push the Limits line of mountain bikes. While these bikes didn’t make our Top 5, they are each worthy of consideration and some of them may be easier to find locally than the Top 5. The Cleary Scout is a trail worthy rig thanks to the 80mm air fork, tubeless ready tires, and durable steel frame. For under $1,000 this bike offers quite a bit of bang for your buck. It also happens to look really good. Like it’s adult-sized counterpart, the Meta HT is a hard-tail steed capable of all-mountain and cross-country riding. Commencal checks all the boxes with a 100 mm Ride Alpha fork, SRAM drivetrain, Tektro hydraulic disc brakes, Alex rims, and Kenda Slant plus-sized tires. 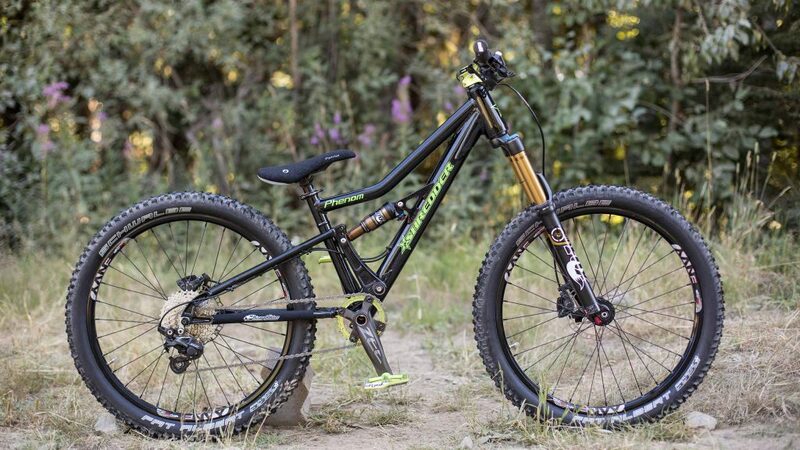 A lightweight build with a progressive geometry design provides a ripping machine for pre-teen trail smashers. The Woom 5 is not intended for cross-country mountain biking, but nonetheless, it presents itself as a capable option. With a listed weight of 18.8 pounds the Woom 5 is far lighter than anything else listed here – due in part due to a lack of front suspension. If your child is going to be riding mostly smooth, tame singletrack, the Woom is worth a look. Just add some fatter tires before taking it out. 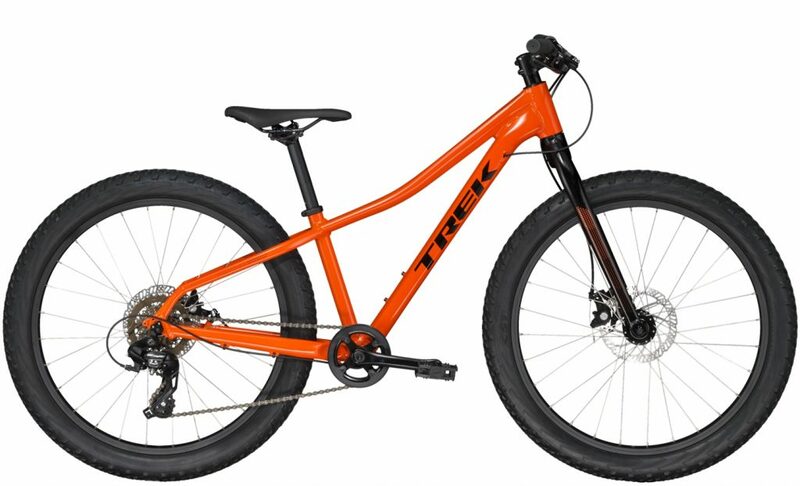 One of the biggest bike manufacturers in the industry, Trek offers a whole line of kids’ bikes. 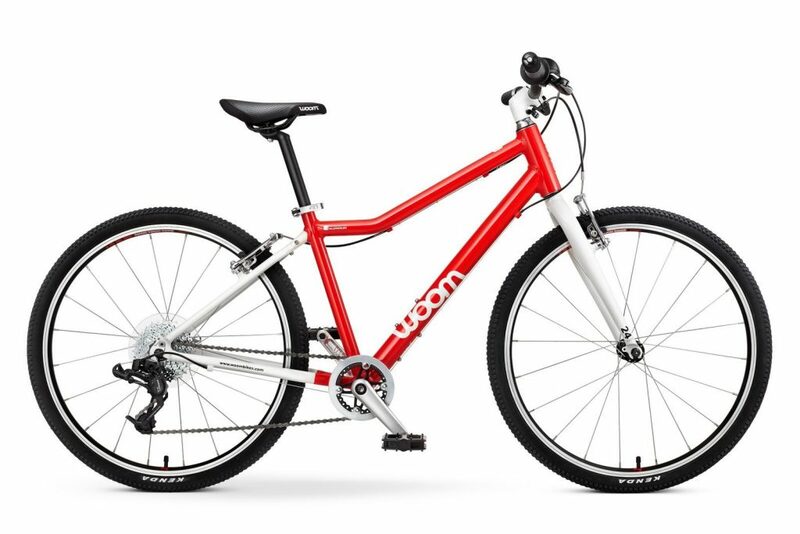 The Roscoe is their 24″ mountain bike offering. The bike boasts a quality build at an affordable price point. The only bummer is the weight which is a bit on the hefty side for a rigid bike. Nonetheless, we like the mid- fat tires (2.8 inches) which can be ridden year round and help add some cushion. The component build includes a Shimano drivetrain and Tektro mechanical disc brakes. Scott sponsors the biggest names on the cross-country race circuit which explains this race-oriented 24 inch bike. The front fork offers 50mm of air dampened travel, and Tektro disc brakes provide adequate stopping power. The aggressive geometry is ideal for young racers, and the bike manages to come in under 25 pounds at a decent price. With a similar build to many of the big names here, the Rocky Mountain Vertex also provides a decent build that will be durable and last. Shimano drive-train and brakes in addition to WTB rims and Schwalbe tires make a nice rolling bike, but there is probably a weight penalty. One can assume, with similar builds and designs that the weight is comparable to that of other big brand names. The overall build is quality and ready to ride though. Like the Kona, the Ripcord is a 100 mm full suspension rig. Transition makes some beautiful bikes with an ever-growing hold on the adult trail/all mountain segment. This bike shows that same understanding and provides a handsome bike with the ability to really shred all over the place. 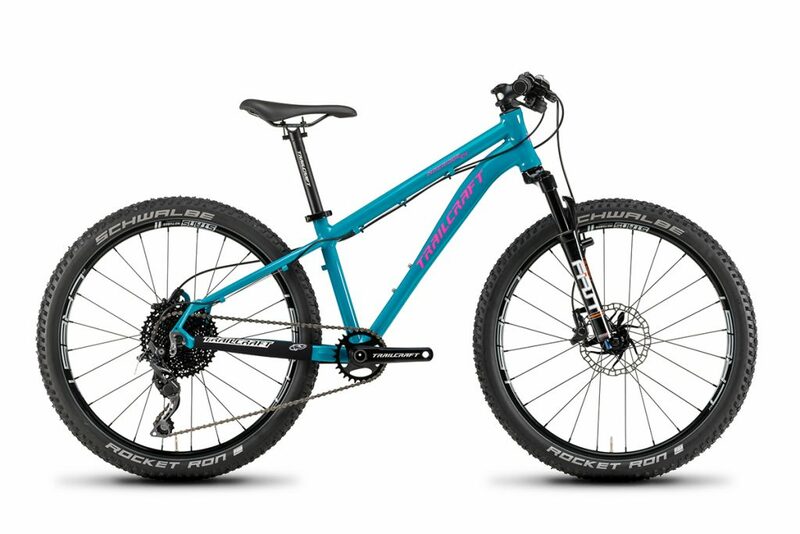 Being that it’s full suspension, the weight won’t be as light as some of the hard tail rippers listed here, but the Ripcord as quite capable of enduring some xc racing with your kids in the cockpit. One of the largest, quality brands on the market, Specialized makes a good bike. The Riprock is no exception. As previously mentioned, the bigger brands offer quality builds but don’t necessarily consider how much weight the youth rider has to muscle around. This bike would make for fun trail riding with mom and dad and can certainly be run in a youth aged xc race (just with more effort than other bikes). 2.8 tires offer extra comfort and if the parent wants to save some weight they can certainly do it there. 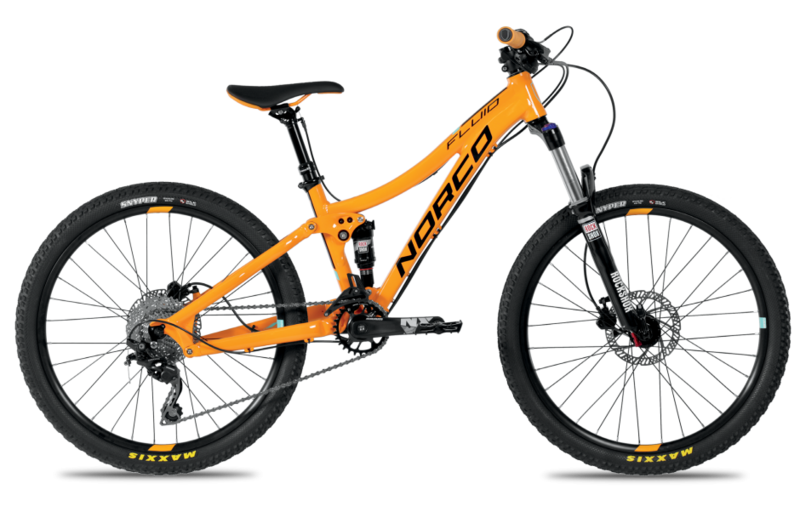 Norco has a quality lineup of mountain bikes and the Fluid 24 fits the bill. Full suspension adds a little weight for cross country duty but provides a plush ride for your little one’s riding pleasure. Travel range is reasonable enough that they can still enter into some XC racing while enjoying a few days at the bike park during the season. Rockshox suspension, a Shimano drivetrain, Tektro disc brakes, Alex rims, and Maxxis Snyper tires offer a nice component build that will last far beyond one childs use and hopefully allow a hand-me-down to the next child or two. 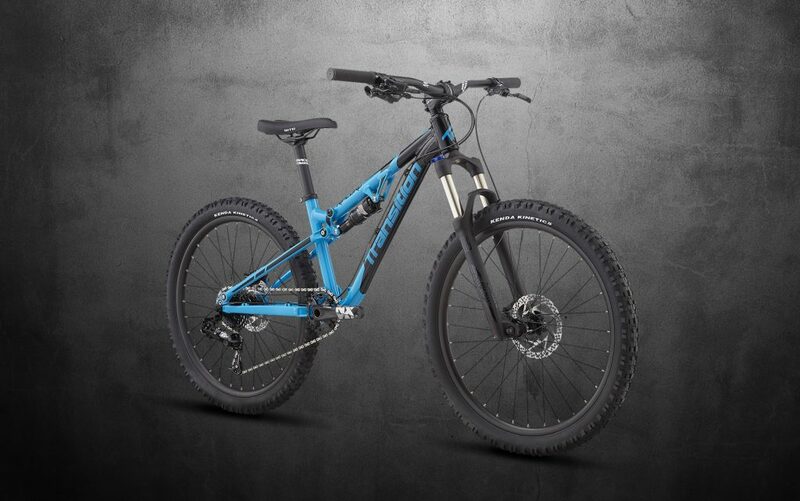 A full suspension rig with 100 mm both front and back makes the Kona more of a trail bike and can even serve some bike park duty if your kiddo is into that. Kona has been popular with little groms for some time now and for good reason. Kona makes awesome bikes that shred down the mountain. Though a bit heavier than other bikes listed here, this ride is still light enough to serve xc duty. Though more conducive to DH riding, Lil Shredder’s full suspension Phenom can most certainly serve as a cross-country ripper with its progressive geo design. Sold as a frame and shock, the build options provide the opportunity to create a fairly light ride for your budding singletrack buddy. Full builds are an option too. We know you’re probably a little nerdy for all the specs (we are too). 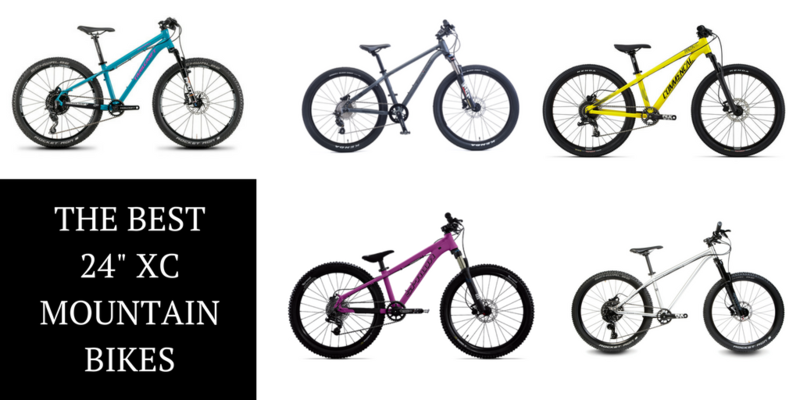 Here’s how all the 24″ mountain bikes on this list stack up against each other. Cleary Meerkat 24: the gear hanger is not replaceable, which is a bad idea, if it gets hit it can damage the frame, you can’t simply replace it. a bad crash can result in useless bike quite fast by this flaw. but it can be fixed by a frame builder, but not really a good choice in my opinion. Yup, that is a problem. Thanks for pointing that out! Hi, what about the Canyon Exceed cf 24 or even the Grand Canyon Al 24 ? 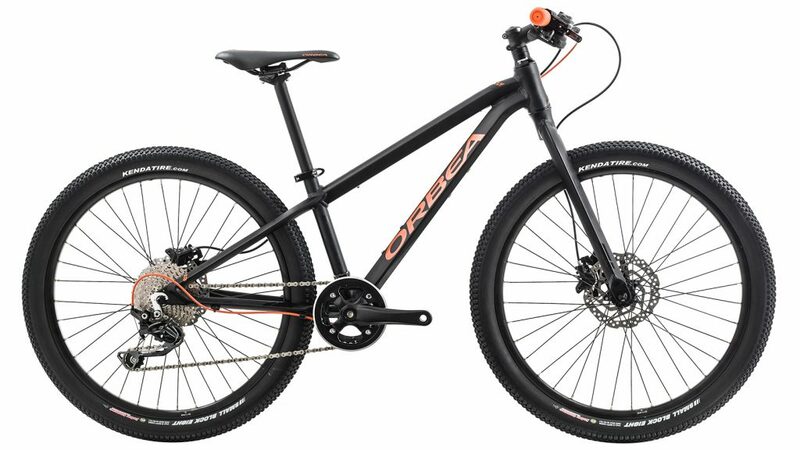 Just bought a Orbea MX24 team disk for my son. I weighted it in at 24.6 lbs stock. This has the straight fork. Thanks Andy! I’ll add that info. The Orbea /MX24 trail you list above has the Suntour shock. His MX24 team disk has a regular fork so it weights less. That was one of the reasons I got the “team disk” and not the trail. It might be a pound heavier….not sure. Thanks for this awesome list. Hangers on steel frames, like the Meerkat, can be realigned if bent with little impact on longevity, but alloy frames would do better with replaceable hangers. Have Cleary Hedgehog, great bike. 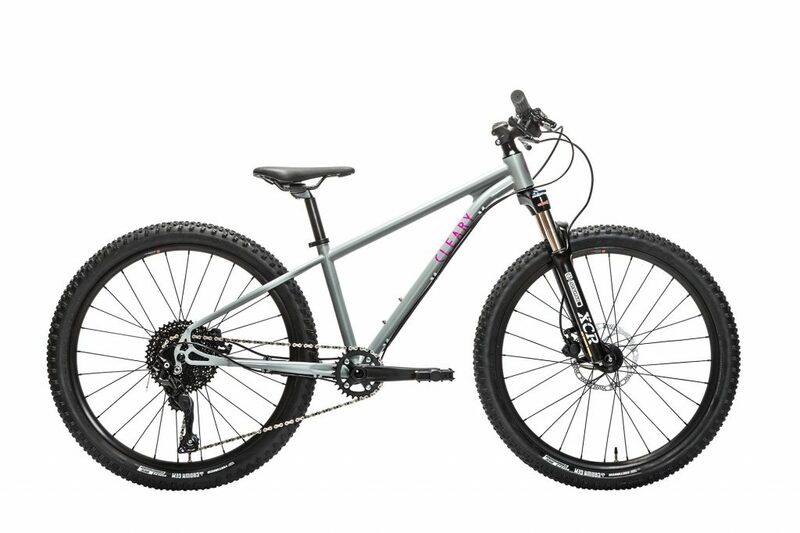 Also, I like the looks of the 24+ category, eg Giant XTC Jr 24+. Great info, thanks so much for putting this together! I’m thinking we’ll get my daughter the Creig pro 24 as her next bike in a few months. She started on a balance bike at 2, and has been hooked ever since! She moved on to an islabikes cnoc at 4 years old, and a little over a year ago (at 5ish) moved up to a beinn 20 that we had them put blackjack trail tires on before shipping it to us. I was also considering the possibility of getting her a full suspension bike, but I just don’t think the extra weight makes sense for her body type especially since she’s not riding any true downhill (yet, anyway!). A couple of those full suspension bikes just look so freaking cool, but I know she really probably needs the lightest weight possible rather than a softer/ squishier ride. At 6.5 years old, she’s 50″ tall with (just over) a 23″ inseam and only weighs 41-42#… so she’s extremely tall and slender, and most of even the really good kids’ bikes just seem like they’d be too heavy for her. Neither my husband or I have ever been big into mountain biking, even when we’ve lived in mountain towns that are hallowed ground for bikers. In our case, our kid has been dragging me – riding on my very old gary fisher hardtail – out onto the single track as often as she possibly can. That makes it a bit hard for purchasing decisions since I’m having to start from scratch on all my research, as I knew next to nothing about bikes. The extent of my expertise was basically just knowing the difference between v brakes and disc brakes, along with the difference between no, front, and full suspension. That said, do you happen to have any advice for pedals, because if we get her the pro model I’m going to have to find someone to walk me through that. Ha! Thanks again for all the info… it’s been super helpful to me as I navigate and try to weigh out (literally and figuratively) our options. According to the Scott website, the SCOTT SCALE RC JR 24 DISC BIKE weighs in at ~22 lbs. By far and away the best deal out there for a light weight24-inch wheel bicycle considering the component spec. I believe you are showing the Scale RC Jr image instead of the Scott Scale image. What about the GT Stomper Ace 24? It weighs 25 lbs. 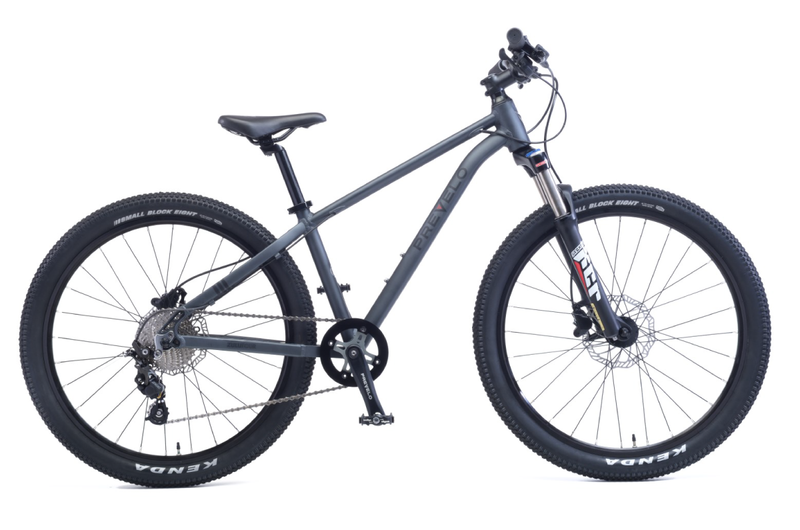 It has an aluminum frame, good geometry, front suspension fork, 1 by 8 gearing, a quick trigger shifter, Kenda Tires, and front and rear disc brakes. It checks all the correct boxes. And it cost half the price of the bikes written in this article. Don’t count this bike out. It has impressed a lot of parents for its value and it is really hard to find in our area. 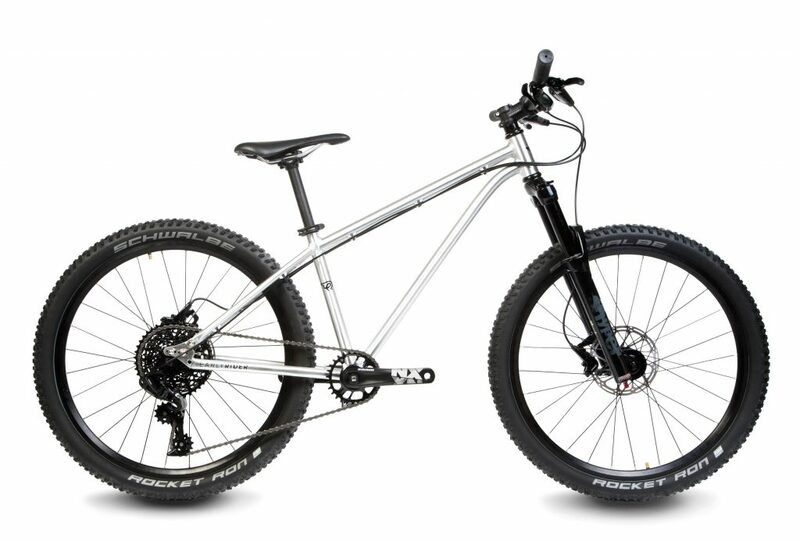 The specs at rei and at early rider put the trail 24 at 24+#. Is there another build option to get it down to/under 20#? I thought we’d get our daughter a creig pro this spring, but those plans were obviously dashed by islabikes suddenly and unexpectedly pulling out of the US… All the more frustrating for me, because they had just put me on the waitlist for one in September and told me to expect it to restock at the end of 2018 or early 2019. They have changed the build and it weighs more now. I hadn’t fixed it in the post; just did though. Thanks for pointing that out. If you want to go as light as possible, take a look at the Trailcraft. We have the 20-inch version for our son and can’t recommend it enough. -Airfork hardtail – Coil Forks on Kids bikes like Suntour XCT are literally the worst fork ever. Walmart bike forks. (whomever is talking about the GT Ace 24 having a nice suspension fork is misrepresenting that fork…that’s a fine bike if you replace the fork and brakes). -Hydraulic disk brakes – these are a must if you are MTBing. No mechanical disk brakes. Hand fatigue is real. -11-36 9sp gearing or better with a 30 or 28t chainring – kids need help with the climbs not the speed. 11-42 is nice these days! 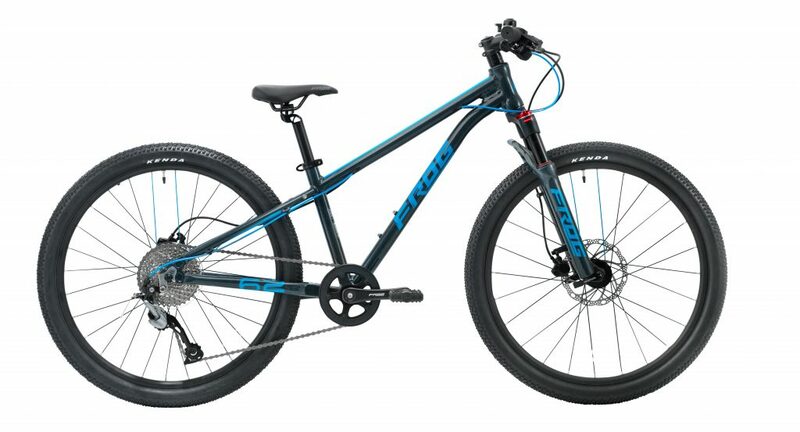 Cheap Bike Recommendation: Vitus 24″ Nucleus is 480$ shipped to the USA (no duty charges) and is an amazing value without having a single significant flaw (I’d like a smaller chainring and wider gearing). Its similar enough to the Early Rider bike and over half the cost. The early rider has flawed 155mm cranks which is the wrong size for kids and makes a big difference (expensive to fix, often requires new BB too). The Vitus gearing isn’t as wide but cranklength is more important and so is saving 600$. FYI To the guy talking about the GT Stomper Ace 24″ bike, that’s a cheap bike with one of the worst forks known to man. Heavy coil fork that is next to useless. Its an OK bike if you replace the fork and mech disk brakes but that an extra 200$. Just look at the TrailCraft bikes and that’s what an ideal bike looks like (aside from their HTA being too steep for a hardtail, my opinion…as 68d is steep and when its under sag and braking downhill, it’ll get into the 70d’s which can lead to OTB). Trailcraft is an amazing company and know what they are doing, you can buy kid components from them too. Prevelo has really stepped it up this year and I expect a Spawn refresh in the next month or two that will up their game as well (needed for their 24″ stuff). Oh and just so parents stop buying road bikes like Woom and Isla bikes…those are road bikes. They are awful for kids developing MTB skills and lead to crashes on even mellow trails. Its the steep geometry and razor thin tires that are awful. Don’t let the weight fool you. If you want a light bike, pony up for the TrailCraft or deal with it. Don’t buy the kid a road bike. You are better off buying a BMX bike (we have these as well) like Cult Juvenile, Fit Misfit, Sunday Blueprint, Weethepeopleseed etc…a BMX bike will help your kid develop into 10x the rider a simple sit&pedal road bike like Woom or Isla ever would. Avoid at all costs if you want your kid to MTB or have solid skills beyond sitting and pedaling. – No coil forks! Rigid is better than a Coil fork. – No v-brakes or mech disk brakes! – No plus tires! Rotational weight in wheels and tires kills the fun fast for young people. Also, buy your kid a Full Face helmet like a Bell Super 3r. Its mountain biking, its dangerous even going slow or jumping speed bumps in the neighborhood (a buddies kid hit his face on the pavement at 5 or 6yro and had to be life flighted out…FF helmet would have saved that). My 3yr hit his face on pavement at pumptrack going 1 mph, a full face helmet would have saved that. Those helmets have plenty of ventilation and are about 750g (light). Buy one. My kids never ride without on and do fine. Its required if they are on a team usually as well. Sale price is around 100$ to protect their teeth, brains and face. Way cheaper than an IPad or ER/Dentist visit. 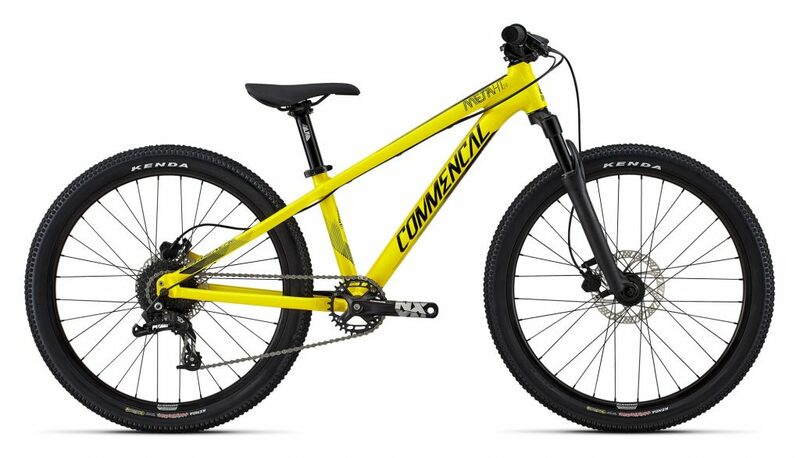 I’ve been looking into s Commencal HT for my 9-yr old. Any thoughts on that? And I love all the thoughts SV had to offer. I’m Che king out Vitus bike’s right now. I had originally planned on getting him theCleary Scout. But now I’m unsure.